Freebies – Oh, how times have changed…. Think back to twenty years ago. Do you remember famous authors ever giving away their books for free? I remember them occasionally writing an original short story for a magazine and it blew me away when they’d do that. I always felt like I was getting something quite special. But times have changed. The Freebie is now the norm and even famous authors are jumping on this bandwagon… You see freebie short stories on their sites, chapters of their upcoming books on their newsletters, free contests and give-aways… The question is, why? Is it because we’re all just trying to build fan bases? Trying to eek through the clutter of the millions of books out there? Is it because the big publishing houses are making it even more difficult for new authors to make a splash in the literary world? Is it because literary agents are taking on less and less clients? I think it’s all of the above. I love the idea of getting my new book release in the hands of readers who may never get a chance to know me because I personally don’t have $10,000+ dollars to advertise like the big houses would. What’s disappointing though is that nowadays the dream of making a living as a writer has dwindled, especially when the majority of our “sales” are “free.” I’ve heard of authors whose promotions were so successful they gave away books in the thousands. I’m not talking 1,000, or 5,000, or 45,000, but over 100,000 free copies of their novel. And these are excellent books that twenty years ago readers would have happily shelled out $25 for a hard copy and $6.99 for a soft cover paperback had it been backed by a big house. Can you imagine a publishing house’s reaction to a 100,000 book download in a single weekend? If an indie can generate that kind of success, no wonder they’re scared. How do the big houses compete and get people to pay for their books if we’re willing to give ours away for free? It’s a catch-22. Of course, we’re doing this to generate fans so that they hopefully come back and purchase our other books. Other books we’re still selling for only $2.99 or $3.99 max. So, that said, I’m jumping in and doing another freebie (Oct 10 – Oct 13) of Book #1 in my epic Dark Fantasy series. It’s called THE WORLD OF KAROV and I’ve gotten 20 wonderful reviews and I have Book #2 in the series, THE RUBY AMULET, launching in November. Please come on over to my author page at http://www.facebook.com/elysesalpeterauthor for updates and follow me on twitter at http://www.twitter.com/elysesalpeter. And if you do download the book, I’d love it if you could give it a review on Amazon and Goodreads. The most valuable gift a reader can give a writer, besides purchasing and reading their book, is to write a review or share the book with others. You have no idea how helpful it is. It helps with analytics, google searches and enables the author to get on specific websites because their books have a certain number of reviews. I’ve made a huge decision. One that took a tremendous amount of soul searching. I always thought the holy grail was to find a literary agent and get my book into a big publishing house. But, the industry is changing and the brick and mortar stores may not even be in business in ten years. While I sit here querying and begging folks to read and represent my finished, professionally edited works, life is moving by… and fast. So, I’ve taken the plunge, I am going indie and getting my novels out. I’m going to join writing contests, going to promote and see where this dream leads. 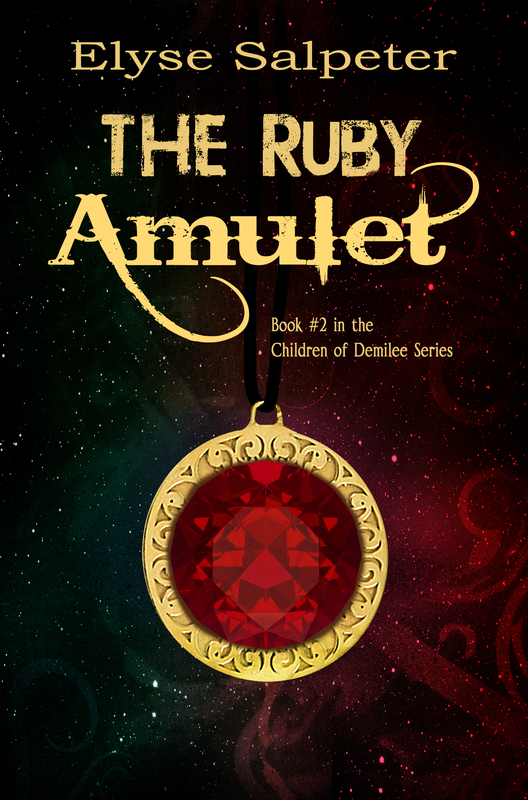 THE RUBY AMULET, Book #2 in the Children of Demilee series. I wanted to do things a bit differently this week and decided to attempt a Vlog. Have I ever done this before? No. Do I have the technical expertise to make it perfect? Again, no. But when I committed myself to learning social media I decided from the beginning that I wasn’t going to be afraid, or scared into immobility. I was going to jump in with both feet. You should have seen me the first time I opened twitter, and I still can’t get off page one of Tumblr, but I try. I realize that if I make a mistake, which I will, I’ll just fix it next time. So many of us stall in social media because we’re unsure of what to do and fear we’ll make fools of ourselves. I spoke to one woman earlier who hasn’t touched twitter because it overwhelms her, and another that won’t even get on Facebook and another that gives me a blank stare when I mention Stumble Upon. These authors are missing out on a goldmine of opportunity out of their fear of the unknown. The issue is, if you never take the plunge, how will you ever learn? So here is my Vlog, with its glaring imperfections. I suggest you “up” the sound because there was a lawn mower in the background (that I never heard until I stopped speaking) and in the copy I pronounced it V-Log instead of VLOG (so commence laughing at me). I did a few other takes, but this one was the best. It’s not perfect by far, but I did it and I really believe that no matter what task you’re trying to accomplish, you must make the effort. I could have waited and done a bunch of more takes. I could have changed my clothing, I could have waited for a sunnier day. But nothing is ever perfect and I was afraid that the longer I waited for perfection, the chances of me actually posting this would lessen dramatically. You might make mistakes and you might get a few snickers, but do it. Because if you don’t get out of your comfort zone, you will never learn. Doing this process taught me how to make a Vlog, it taught me how to upload it to Youtube and it taught me how to integrate a video into my blog – so you see, win-win all around. So click the you tube link, put up your sound, feel free to comment, and enjoy my pumpkins! Ha! I thought I was done with all that “summation” stuff when I decided to self publish my Children of Demilee series. But, that was far from the truth. Okay, so I don’t need to write a one pg, three pg and five pg synopsis for an agent, or do an outline, but I still need to develop teasers and those difficult cover blurbs. You know, sum up the entire book to entice a reader to purchase it in just 100 or so words. Yeah, how hard can that be? 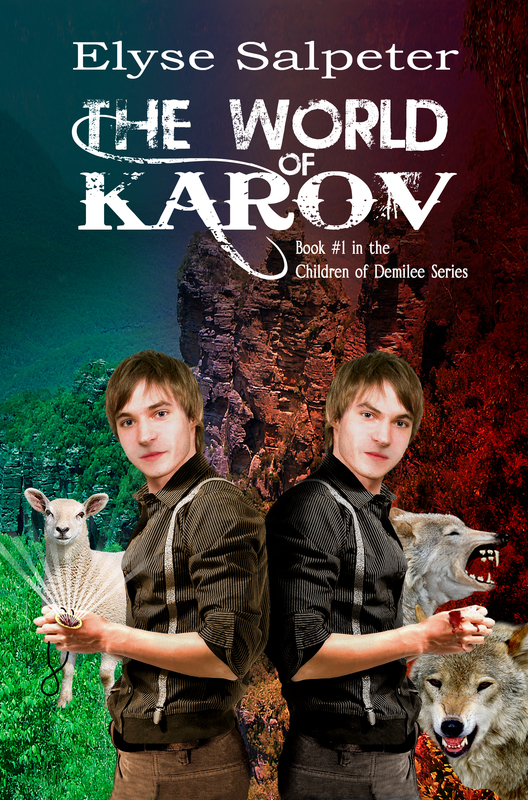 Book #1 in my series is called THE WORLD OF KAROV. It’s been out in market for a year and is about twins, magical worlds and a pervading evil spreading through the universe. It’s a very dark tale, pitting good against evil and brother against brother… and only one will win. Book #2 is called THE RUBY AMULET and continues the series four hundred years later. My beta readers have assured me it’s a good tale and people will be quite happy and mollifed with this novel after reading Book #1 (and I can be assured my aunt won’t call me up at work and yell at me about the ending for ten minutes this time). These books will appeal to a wide range of readers from YA to adults. So, which teaser do you like better for THE RUBY AMULET and which Cover Blurb feels better to you? I’ll continue to edit them all, but would love your “interpretations.” Thanks so much for helping – you have no idea how much I appreciate it. Teaser #2: Some say legends are just legends… and those people would be wrong. Cover Blurb #1: When Joshua found the ruby amulet, his life changed forever. A jewel with the power to transport him to the World of Karov; a war-torn land whose inhabitants have been kept prisoners for over four hundred years. The Karovites are desperate, because their treacherous King is searching for a fabled four pound ruby of myth. It is said this gem was hidden centuries ago by The Ancients, a mysterious race of children, in their desperate attempt to conceal its location from a pervading evil spreading throughout the dimensions. The King is closing in on Joshua and the gem. He and his friend Sean must help the Karovites win the war against the kingdom-and against time. For if the king finds this ruby before they do, he will become the most powerful being in the universe, and the great evil will have won… for eternity. Cover Blurb #2: A ruby discovered in a mountain stream transports Joshua, and his best friend Sean, to the war-torn world of Karov. They are immediately caught up in a violent struggle between the enslaved people and their treacherous King, who is determined to find a legendary four pound ruby hidden deep in the emerald caverns. But time is running out. The King is closing in on Joshua and the gem, and the boys must help the Karovites find it before the King does. For if the King gets to it first, he will become the most powerful being in the universe and the Karovites will be enslaved… forever. If you’re able to leave your comments and selections below, I’d truly appreciate it. Or feel free to go to my FB Author page and leave your feedback there at http://www.facebook.com/elysesalpeterauthor. Or in the comments on my newly revamped web page at http://www.elysesalpeter.com! Thank you so much! 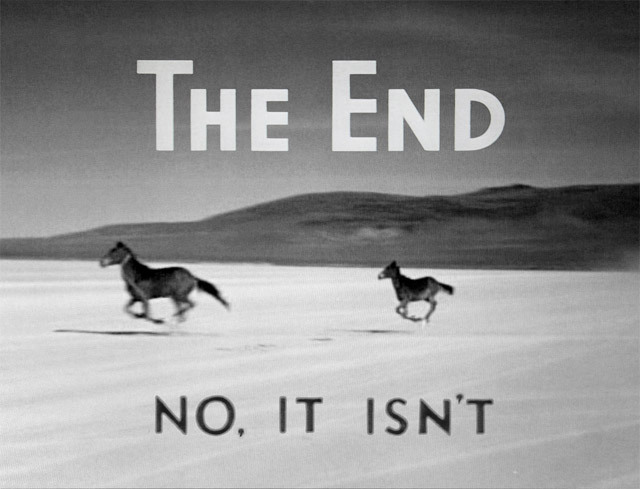 I Wrote THE END… I’m Done, Right? Ummm… No. We were once all Newbie writers. The first time we wrote “The End” on our first novel, we thought we had produced the world’s greatest piece of literature ever written. Why wouldn’t agents and publishers be all over it? Don’t they know we’ll make them millions? We’ve all been there and I get it. For twenty years now I’ve been writing and those first newbie moments have come and gone. I was so green that when I once received a rejection letter from a literary agent telling me I needed my novel seriously edited, I actually called her and grilled her about “what does that even mean?” I can’t imagine her dinner table conversation that night. Still, this kind, gracious agent actually took a moment to explain what that meant and led me to the editor I use today. This is not to say that twenty years later I know this industry inside and out, because I don’t. This business (because it IS a business) is changing constantly and with the addition of social media, I’m learning right along with everyone else. But, I know the first draft of a new novel is not the world’s greatest masterpiece. It’s just a first draft and I’m now savvy as to what comes next. The work, the editing, the tearing out of my hair as I clean this monster up. But newbie writers are like little kids. They don’t know yet what is coming. The moment I hear someone say to me, “Oh yeah, I always wanted to write a book,” my response (years ago) used to be “ooh, how exciting, go write it!” My enthusiasm was endless for them. That’s waned after I soon realized these people had no intention of ever sitting down to write a book, much less finish it. Now I just smile because while I’m excited that person wants to step into this literary insanity, the chances of them actually doing it and completing it are extremely rare. “Wanting to write a book” is very different than “writing a book,” which is very different than “getting the novel ready for publication.” Every step along the way requires a tremendous amount of effort. I’ve worked very hard at this craft over the years and tried to learn this industry. I finally acquired an agent and also self pubbed a book. And while I do not profess to know everything, there are some bits of advice I can impart to new writers who just finished their first draft. #2 – Learn Social Media. Even if you get that agent or get that book deal with a publisher, as a new writer, you will be required to create your own social marketing platform. So, get yourself a webpage, a blog, a Facebook Author Fan Page and a Twitter acct. If you’re Type “A” also get on Google+, Goodreads and a host of other author sites. Get a book trailer going on youtube. Do everything you can and link it all back to you and where someone can purchase your book. You need to build your fan base to get the word out that your novel is ready to be read. #3 – Keep writing. Why? Because if you sit around watching your Amazon ranking #’s or sit around waiting for the agent to call, you will fall into a great, sinking depression. Always keep yourself busy with another WIP, short story, flash fiction. I don’t care what it is, but keep writing. The more books you have out there, the better off you will be and the more sane you’ll be having your mind kept busy. So, I leave you with this new writers… yes, some badly edited works get picked up and make millions. But honestly, that’s like winning Lotto – it’s really not real life. So instead, congratulate yourself on taking the first step and finishing your book. Now take the second one and pay to get it edited by a respected editor… and then take the third step and get your ducks all lined up. It’s going to be a heckava ride! Please feel free to check out my Dark Fantasy Tale THE WORLD OF KAROV. The sequel, THE RUBY AMULET is scheduled for release, December 2013.